On Sunday night Syrian state media reported that air defense in Damascus was activated against a threat. Yet within an hour the state media had deleted the report and locals said it was a false alarm. This comes amid jitters in Damascus about potential airstrikes and the Russian decision to supply Syria with the S-300 defense system. However the full story of what happened, including reports of explosions, is not entirely clear. Was it a false alarm, a mistake, or something much worse? The alleged “airstrike” that apparently did not take place was first reported around 9:30pm. It would have been the first incident since Syria reported airstrikes south of Damascus on November 30. In that incident a strike allegedly targeted an Iranian-backed militia near Kiswah. Reports indicated that Syria did not use its S-300 system which may not be fully operational, to interdict the strike. According to numerous online accounts that follow air traffic, the rumors of the air strike on Sunday came after a mysterious Iranian cargo plane, which some labeled a 747, headed toward Syria at 5pm. It was one of several reports of air activity over Damascus in the afternoon. Reports initially claimed that “cargo” was struck at Damascus International Airport. The reports indicated that air defense had fired several missiles but no videos were produced of them. 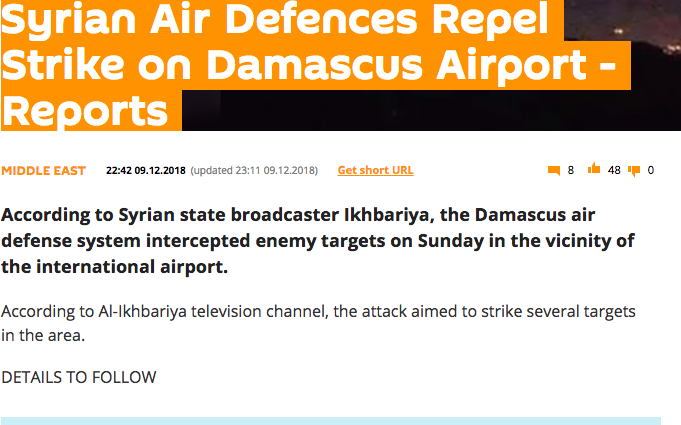 The Within Syria Blog reported “sources told me that the target of the airstrikes may be an Iranian cargo plane which reportedly landed earlier.” SANA, Syrian state media, claimed “our air defenses intercepted enemy aerial targets in the vicinity of Damascus international airport.” Reuters picked up the story. The incident points to the fact that residents of Damascus, online accounts that follow the conflict in Syria and Syrian state media are quick to report details that may be inaccurate. Unlike in other incidents there were no videos of the alleged explosions, or audio. This adds credence to the theory that it was a false alarm or some other sort of alert. Because Damascus has been targeted by airstrikes in the past, including the airport area, many are on edge, including the air defenders, and may overreact. However this does not fully explain why state media would create a false report. Obviously something happened that caused them to do that. Their initial report even claimed “success” by the air defense. Was the air defense activated by mistake? The incident will lead to speculation about exactly what happened on December 9. Was this a Syrian error, or was it a more complex incident? Social media experts, even those claiming to have “local sources” or “regime sources” may also err in their description of what happened. They may also put forward theories, such as claims that the S-300 system was being tested, to cover up for Syrian air defense errors or for a more serious incident. Syria’s Russian ally, which supplied the S-300, will be watching this closely. If the radar malfunctions or was “jammed,” Moscow will be keen to know that its system or those it trained to use it have made mistakes. Syria’s air defense used an S-200 to mistakenly down a Russian IL-20 in Latakia in September, during an Israeli air strike, which led Russia to send the S-300 to Damascus. Now there will be questions about what Syrian air defense did on Sunday night. In recent months there have been numerous reports of suspicious Iranian activity, including flying cargo planes to Beirut and elsewhere. This has all fueled tensions. Israel launched an operation to root out Hezbollah tunnels in the first week of December and Netanyahu met with US Secretary of State Pompeo in Brussels.